Sam's obituary in Ovens Valley Register in 1916 summarises his life as a miner. One of the few remaining links which connect us with stirring and romantic days of the early diggings was severed on Sunday by the death of Mr. S. Wright (Snr.) of Stockdale at the age of 82 years. Mr. Wright was also present at the anti-Chinese riots in Lambing Flat and Buckland. Meeting with indifferent success elsewhere he returned to Nine Hill (now Stanley) near Beechworth where he was for some time engaged in sluicing with the late Mr. John Boyd, Mr. Phillips and others (Mr. John La.. ) was a member of the Beechworth Mining Board for seven years with a term as Chairman at a time when that district contained as many votes as North Gippsland does now and he was also connected with the Stanley Road Board. About 25 years ago, being tired of mining he came in the wake of his old friend, Mr. John Boyd and selected land at Stockdale and has been in this district ever since. With a large and varied fund of ideas and a forceful and pithy style, Mr. Wright was a frequent contributor to the Press of his day with letters and articles on matters of public interest, and an occasional excursion into the realms of fiction with a fund of anecdote and reminiscence of the romantic days of Victorian settlement, a conversation with him (while his memory held) was at once a privilege and an education. Nothing used to make him more indignant than to hear the early squatters described as pioneers. It was his favourite argument that the real pioneer was always the miner as wherever he went he was the precursor of settlement, while the squatter did his best to discourage it. A keen politician, with advanced democratic ideas, he had great faith in the future of Australia and Australians. In a word, one of the grand old brand whose struggles and teachings were the genesis of Australian democracy and who helped to win for us the rights of self government and political liberties which are our pride and heritage of today. Towards the end of the year 1852 I had migrated from the busy scenes of Mundy Point and Ration Hill to the quiet retirement of Golden Bar, Lower Turon. At this early period of the diggings the bulk of the population on the Turon was crowded into a space of some ten or twelve miles from the Lower Wallaby Rocks to Ration Hill. Its lower portion, from the Wallaby down to its junction with the Macquarie, being sparsely occupied by a few parties scattered at long intervals over the various bars. Why our bar was called the Golden I never could tell unless by presuming that the nomenclature possessed a turn for .... for most assuredly it was not superlatively rich. Indeed it was a very ordinary digging and would have been contemptibly described as 'tucker ground' by most diggers in those days of great yields. Still the tucker that our party of four knocked out was by no means contemptible; in fact it was a very liberal dietary scale. The waterholes, unpolluted as yet by mud, abounded in fish, perch and cod, and thin crystal ... (the waterholes, not the fish) even ruffled nightly by flocks of wild fowl. The precipitous bluffs termed Wallaby Rocks, projected their ... sides into the stream here and there swarmed with the animals from whence they derived their name, and in the rugged fastness of the surrounding mountains herds of cattle roamed fancy free of them ever been subjected to the ignominy of a brand. Occasionally on a sunny sand bank by the margin of the streams a patch of water melons or pie melons were to be meet with, and the plant vulgarly known as 'fat hen' grew everywhere in profusion affording an admirable substitute for spinach. Thus with fishing, shooting and cattle stalking in the intervals of our gold seeking, the time passed pleasantly and profitably with us. Every Sunday one or two from each party would ride up to Jim Stuart's Store for supplies, a distance of ten miles through the mountains, returning the same night when Jim's rum did not prove too powerful. Occasionally some more adventurous spirit would penetrate ten miles further to the Flat as the rising township of Sofala, our mining metropolis was generally called then. These expeditions were the links connecting us with the outer world, and by means of them we kept about as well posted up in current events as the public of this colony now is in home affairs through the agency of the P&O Company. The population of Golden Bar was migratory, seldom if ever exceeding twenty in number. As our party possessed the richest claim, precedence must be conceded to it. At the time I write of it was made up of as follows. It consisted of myself, a cousin recently returned from California, who, in virtue of the experience acquired in that country was looked up to as our great mining authority and head man. A maternal uncle of his known as the Captain - he had been a lieutenant of yeomanry at home, and of course acquired brevet rank in this country - genial hearty old gentleman over flowing with dry humour and racy anecdote. He was a keen sportsman and it was really a treat to watch him strike and land a fish, he did it in such a manner. Of course he was proud of his skill with the rod and never shall I forget the look of disgust and loathing with which he regarded a small tortoise in the capture of which he had just expended about half an hour and all the piscatorial wiles he was the master of under the impression that it was a fine perch. The gill of laughter which greeted his success rather disconcerted him but after a contemptuous glance round at us and a viscous kick at the miserable cause of his discomfit lying sprawling upon the sand, he was compelled to join in our mirth. he never fished off that sand bank again tho'. The last of our party was a hoary headed old su..., named Smith, a compositor by trade and much addicted to rum. He also had been in California and on the strength of this - altho' he had never set foot outside San Francisco - pretended to much knowledge of gold mining. From the above we see that after a time at several sites on the Turon the party set off to try their luck at other fields. The obituary indicates they first went to Spring Creek now called Beechworth in 1853, then to Stawell in October 1854, on the Buckland River in 1857 and Lambing Flat in New South Wales in 1861 before settling back in northeastern Victoria. The obituary says that during the next few years he prospected along the Ovens Valley and then concentrated at Nine Mile (now called Stanley) where he worked with John Boyd and a Mr. Phillips. Research by Geoff Craig (now held by the Burke Museum) show that a mining claim was registered by S W Wright on 5 September 1856. In August 1858 “S W Wright and Co” registered a claim on Back Creek in Stanley (then called 9 Mile, being that distance from Beechworth). 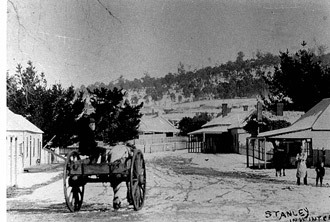 In 1856 the Beechworth area was home to 13,000 Europeans and 2,000 Chinese. )When Sam and Willy returned to Stanley from New South Wales, in the early 1860s, the population had declined to 1200. Many of its former 19 hotels had closed but it still had a library, a local newspaper, the Stanley Time, an orchestra and a drum and fife band’. It also had four churches and a joss house. By now gold was scarcer and new methods were needed. Springs were available and by cutting deep channels into them and driving tunnels large quantities of water could be released and stored in dams. Periodic releases of water into a tailrace sluiced away the overburden and allowed the gold to be collected. Willy registered another Stanley claim in his own name at Ben Rinne in January 1864. His company registered two claims on the Reform Field at nearby Myrtleford between 18th March and 1st of May 1865. Samuel had also formed a company and also registered a claim at Myrtleford on the 1st May. The claims at Mrytleford were ‘adjacent to Milnes’. This must be a reference to the Scotsman William Milne (see later). In September 1866 “Samuel Wright & party’ registered another claim near Wilson’s on the upper field at Stanley and Willy obtained another at Rocky Creek on the Buffalo Field in August 1867. We know something of two of the cousin’s fellow miners. John Stride Riply seems to have returned to his family in London about 1865 and William Milne who returned to his home in Auchreddie Aberdeenshire, Scotland around 1869 but returned to Stanley soon after. But the most important friendship was with Joseph Whitehead who became his father-in-law. In February 1869 Sam married the 19-year-old Elizabeth Ogden Whitehead at Deep Creek. (The stream of this name cuts the road to Stanley just before Hurdle Flat - see map above). It seems likely that the ceremony was performed by a visiting Minister from either Christ Church in Beechworth or the Presbyterian R K Ewing. Elizabeth had arrived in Australia from America with her parents and brother John, about thirteen years earlier. Joseph Whitehead, and his forebears came from Lancashire and Elizabeth inherited her middle name from her paternal grandmother. Elizabeth was born in New York, proud of her American birthright, and sang the Star Spangled banner to her grand daughter. Lizzie’s parents had been married in Manchester in 1844 and joined the flood of migrants migrating to America to find a better life. By November 1850 they were living in Norwich, New London in the neighbouring State of Connecticut. There Joseph found work as a labourer in a cotton factory and share a house with fellow worked Thomas Wilkinson and his wife Hannah. Lizzie’s brother John Joseph was born there in May 1851. Lizzie said ‘they crossed America in a covered wagon’. Presumably the four of them travelled to California soon after John was born. In mid 1856 they decided to move on to Australia and arrived in Port Phillip from New York on the Queen of the Seas on 9 September 1856. Those facts leave open the question of who went to California and how long did they stay. Joseph paid £10.12.6 for each of them, a tidy sum in those days. Joseph registered his claim in Stanley in June 1859 and probably mined elsewhere beforehand. Joseph and Margaret had five more children in Victoria between 1857 and 1866. A series of seven letters from Riply (picture left), to Samuel over the period 1865 to 1874 exist but throw little light on his life. But the best information comes from Sam’s essays and a journal that covers three months of his life in 1869 beginning shortly after his marriage. In February 1869 Sam married Elizabeth Whitehead in Stanley. She was then 19 having been born in New York, U.S.A., during her family's journey to the Californian gold fields and arrived in Victoria in 1858. Elizabeth Whitehead belonged to mining family and was the eldest of four children and arrived in Australia as a child in 1858. Her father, Joseph Whitehead registered his claim in Stanley in June 1859. When the journal begins Sam is newly married and still actively mining but William, now 49, (picture right)had abandoned mining and owned the Star Hotel in Stanley. Sam, now 35, still depended on his cousin for financial assistance that he repaid through maintaining William's accounts and writing his letters. Despite falling returns on the alluvial grounds mining was still big business in Victoria with over 1200 new mining companies being registered in one year. Sam's mining was by sluicing which depended on a complex of channels dug into the slopes from springs. Effective mining depended on regular rainfall to maintain the springs. Finished washing up with the magnificent result of 1 - 19.18. In consequence Jack seceded and tomorrow I commence trying upon my own account. Heaven knows how things will go, This may be but the beginning of the end and but certainly prove so if water does not increase, God help me I didn't know which way to turn or what to do for the best! In the meantime I must slave on where I am for a time as I know not absolutely what else to turn to. Worked two days by myself, getting on much better than I anticipated. Indeed the ground would pay much better worked single-handed than any other way just at present. However Jack came down yesterday and signified his intention of resuming operations. Been humbugged with the race breaking away at Back Creek. Hope we made a job of it yesterday. Tuesday 3rd Mizzling again all day. Got all ready for starting into the surfacing tomorrow. ...... Great report from the claims on Milkman's! How did we miss it there. Any amount of good ground laying about us, left untried. Still we were burdened then with a frightfully heavy water tax and that acted as an incubus on us, deterring us from much prospecting, a loss of time. We were careless too in those days. In fact I suppose that it was not our destiny ever to make money anywhere. Race broke away again. Went up with Dave and put two boxes in but it requires about six to make a job. Some of these days soon about twenty yards of ditch will settle down bodily and then perhaps they will mend it properly, The crayfish also have been boring holes to a frightful extent above Johnson's. Between them and the broken ground we stand a fair chance of losing half our water and this is more particularly annoying now as the springs are rising visibly. This break down will prevent us washing up this week as we had intended for which I am sorry being anxious to see how this ground will shape. Judging from prospects and all appearances it ought to go well, but I have been so often deceived that I never feel certain now until the gold in weighed. Washed up last week 6 oz. and 14 gr. gold, not bad but from the look of the sluice expected more. Water increasing also its price, as we have made a fine show this week. Unfortunately the ground looks a deal poorer. Had a small wash up last Thursday 26 dwt. This is poor unless a great deal of gold went down the sluice. At last my building is fairly commenced, Tom having put in an appearance this morning to lend me a hand. We succeeded in getting the slabs and rafters on. The addition will make a wonderful difference in the size of the house and in the course of two or three weeks I hope to have a tolerably comfortable home over my head. The claim is shaping very poorly, we only got a bare ounce. The frost has at length broken and about 3 o'clock this morning rain set in heavily, Continuing at intervals thro' the day - in consequence water was plentiful. Rain has re-commenced tonight with every prospect of continuing. ....... This was Lizzie's birthday, spent by her quietly at home, keeping the fire warm. Upon my return home found a note awaiting me from Hughes containing a gentle reminder about that £3. I am unfortunately indebted to him. Confound him he has bothered me as much about that small sum as if it was twenty times as much. He must have patience as I have myself. Perhaps he thinks that I may be intending to take the benefit of the act like Charley Tilton and our esteemed friend Ryan. This last gentleman has recently collapsed on the Buckland - liabilities $92 odd, assets £6, cause is unsuccessful issue of mining speculations at Hillsboro' and Buckland. I was nearly into a nasty scrape last week without knowing it. When I first took possession of this house Dunn !?) came round with his rate papers. I told William about it, and expecting that he would make it all right, thought no more about it. But neither did he it seems, for a few days since Mr. Dunn(?) came out armed with a summons for the infernal 7/- increased by this time to nearly £1. Fortunately William found out his error and settled the affair. From Dyring (?) I hear too that he had some very sharp exchanges between him and Clark relative to the "New Stanley" quartz lease and my name was very freely, and by no means in a very complimentary manner, handled. Well I will be square with all of them yet and perhaps a little more. Only patience! .... the mining mania was foolish ever to be drawn into it against my better judgement. Wrote a letter to Caroline for William and a stiff production it was. I wonder what she will think of it when she reads it? Sam Norton has been hankering after the Star and William is writing to let him have it but only on cash terms. I hope to goodness he will make a bargain and relieve William from what is now fast becoming a burden to him. Times are bad and becoming no better daily. One of the most sickening jobs I have had for a long time was the transferring of all the old year (?) from one ledger to another. A mere formality for I don't suppose 5 per cent of the whole will ever be recovered. On Friday last I received a missive from Hughes requesting my appearance at the police court Stanley upon that day week. This miserable little hound, I won't forget his kind attention. Fortunately it will not be necessary for me to appear as William has undertaken to settle the affair. - Another death! Another funeral! Another victim to that destroying angel Diphtheria which spares neither youth nor age! Poor Stubbin was consigned to his last resting place at 3 o'clock this afternoon, about 100 persons attending. No doubt there would have been many more but for the shortness of the notice, he having died only at one AM. At that time with his hand clasped in William's, he passed away without a murmur, scarcely a sigh; peacefully as if in sleep. With William were Mathieson, Smith, Scarlett, Harridge and one or two more. just previous to dissolution he revived wonderfully, felt better; greatly better; would pull through. Even his voice became louder and fuller. Alas it was not to be; the fiat had gone forth this was to be the last faint flicker and flaring up of vitality. In a few moments he had gone to his rest. When I went up town yesterday evening William had just returned from visiting him, and told me he could not hold out many hours longer. With the morbid distaste I have to coming in contact with death or anything approaching it, I did not go to see him. Yet notwithstanding this breach of the conventionalities I doubt whether any round his grave this day mourned him more sincerely than myself. As I stood watching the last shovel-fulls of earth piled over his remains he appeared to my mind's eye, visibly before me. Not as I had last seen him a few days since but as of old. And the memory of the many pleasant times he and I had together came back to me so vividly that I was fair to turn away, with moisture in my eyes, He is gone, there is a gap in the institutions of Stanley for he was one in his way, and one not to be replaced. Yet how long will this gap be apparent? How long will his memory keep green? But a short time indeed! Such is the world's way. And perhaps so much the better. Upon returning to town everything had assumed its usual everyday appearance. The billiard table was busy in Little's, groups seated round bar fires, but of Stubbins nothing, he had faded out and his vacant space was hardly noticed. Requiescat in peace. The very muminence(?) of death itself could not quench his irritability. Yesterday afternoon he would keep breaking out with "When will the struggle come, "When will the struggle come and finish it?". It has come, and gone the next is in God's hands now. Sam accepted the unique socio-economic culture that developed on the gold fields in the 1850s and was a staunch advocate for its ideals. Whilst they competed as small businessmen their was a strong sense of community with many of the characteristics of liberal socialism. It was based on equality and acceptance of other nationalities provided they were European. The Chinese miners with their equally strong culture were not welcome. In February 1861 Sam was one of 3394 miners who petitioned the New South Wales Parliament against ‘having been invaded by several thousand Chinamen during this past month and being informed they intend making this (the Burrangong Gold Fields) Chinese territory’. The miners craved protection from this ‘ by the removal of the Chinese catastrophe’. Samuel William (Willy) Wright was an important figure in Stanley, hosting meetings of the Loyal Lodge of the Independent Order of Oddfellows, and was trustee of the Stanley Recreational Reserve. In June 1861 he was granted the licence for the Star Hotel in Stanley and although no longer actively mining he still held leases at Myrtleford. He was running the hotel up until 3 December 1875 when he had a sudden stroke and died there, aged 55. He is buried in the Stanley Cemetery. The Hotel was taken over by Thomas Scopes in 1877. •	James Edward born Milkman’s Flat, 16 April 1876. •	Cecil born 17 October 1879 at Gulgong NSW. The latter years of the nineteenth century saw the rise of Labor politics and the coming federation of the colonies. 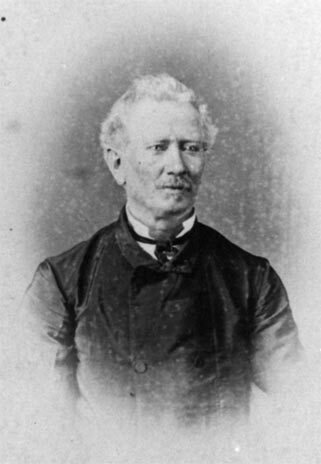 Samuel was keenly interested in both; he served for seven years on the Beechworth Mining Board with a term as Chairman and was involved with Labor politics in the north east and latterly in Gippsland Samuel began to play an active role in politics around 1870 and two years later he was elected to the Board. Sam opened his campaign at a public meeting in Ellen’s British Hotel at Three Mile on Saturday evening 17 February 1872. In wooing the voters for the first time he admitted his inexperience ‘if I don’t have the gift of tongue I will at any rate do my best to give you my opinion on two or three subjects as intelligently and concisely as possible’ he told meetings of miners. With regard to Commons, I believe those people, those immediately and beneficially interested in them having management of them and working for the best advantage they can.’ For this stance he was criticised in an editorial in the Ovens and Murray Valley Advertiser. ‘A third candidate has presented himself in the person of Mr. S Wright, evidently an educated and intelligent man, who bears the highest character.’ The editor clearly preferred the sitting members particularly Mr Lorimer. ‘Mr Wright contends that the Mining Board is usurping functions that should properly devolve on local men.’ Sam supported the historical right ‘of the commons’ where all persons had access to public land for grazing. On 26 February he replied to the editor. Firstly then I am accused of coming forward as an advocate for free grass. This I deny at once, for I hold that any privilege worth having is worth paying for. But I contend that after paying, any man - even an unfortunate dairyman - is entitled to receive some protection as an equivalent far the money he has paid. All the protection accorded to him at present consists of a herdsman's receipt and a tar brand on his cattle. As neither of these seems to possess the power of keeping his cattle out of the pound he naturally enquires whether it is not possible to apply some of this immense surplus which has been flaunted before us so much in such a manner as to afford him some little protection for his property. For agreeing with him upon this point I am accused of enunciating the revolutionary doctrine of free grass. I have advocated local management upon the broad principle that those who were immediately and beneficially interested in anything were the men most likely to manage it to the best advantage and I affirm the principle that still. Notwithstanding the wholesale charges of mismanagement and maladministration brought against local mangers during the late contest. But even in the Gomorrah of local mismanagement there was found one honest man - upon Eldorado - who actually proved that during his year of office the surplus had been in excess of that produced under the Mining Board. In conclusion I may say that I have no personal interest in the matter. I came forward as a miner at the solicitations of fellow miners; and by the miners have I been elected, But as man does not live by bread alone, neither does the miner of the present day live by mining alone, and if he chooses to supplement his earnings from auriferous sources by the rearing of a few head of cattle or even goats, I don't see that he should be placed beyond the pale of protection. The voting was on 24 February and Sam polled 266 votes to 219 by Lorimer. Mr Murphy polled only 211 votes and lost his seat. The Advertiser congratulated him but still maintained ‘that he got in on a false issue so that his friends and supporters will have to pay just as much for commons fees as they have hitherto done.’. On his election he received a letter from another politician James Worral that illustrates Samuel’s electoral style and political views. Just received your note evidently written in good spirits and no wonder. Ward told me last night that you got exactly the same number of votes that he polled when running against Barras 4 or 5 years ago - the highest number polled at any election. When you happen to meet Horrocks tell him that you have it on the best authority that he was the man who put you at the head of the poll on Eldorado. He thought and persuaded others to think that Lorimer was safe to get in - and so induced a good many to plump for you. If I had a strong desire to see Lorinna as safe as Horrocks believed him to be I certainly would have objected to his tactics and I told him about four o'clock - when the damage was done - that the move was far from being safe one for Lorimer. But his desire to see you in and Murphy out made him somewhat reckless in regard to the safety of Lorinna and he worked accordingly to your advantage - and work he can. I'll back him to get 5 votes for any other canvassers' other - on Eldorado - I certainly did all I knew and was very well pleased to be able to make Mrs. Sebb all of a flutter when she came to the court house about half past four. Don't be too ambitious all at once, curb your "fancy's flight' you are not Chief Secretary yet. I give you this admonition, fully convinced that you have been castle building with a seat in the Leg. Assembly as cornerstone. Have you been to the mountain top practising your maiden speech. I don't mean the one you intend for the edification of the Curators of Auriferous Ores and Crown Lands and Representatives of Commons in Beechworth assembled - but the one you mean to give when you go to Melbourne. Have you formed yet the basis for the Confederation of the Colonies and the Southern Republic. Maybe I am wrong and you are only casting about for some local grievance of which to air your oratory and try your power of resistance to that stupefaction which some how comes over one when first appearing - partly pushed - before the public. Mind you it is not a bad idea and one that deserves your consideration, for although it may at the start be rather difficult to become oratorical over a water right or eloquent about an impounded goat, yet if you do not become proficient in handling little grievances, you wont get the chance of handling big ones. inclined let us hope they are at the present time soaring in celestial skies beyond the tumult of this same wearisome world. I found also that Bill Morton was dead, in fact almost everybody. The Rocky Mountain is now working the ground on Spring Creek once occupied by those with whom I had at one time laboured, I made many enquires for you. People down here liked your manner, imagined you had good common sense, and admired your candour and straightforward way of answering questions (this got you more votes than the canvassers) and seriously if you set your mind to cultivate the art of persuading a man against his will you stand a good chance of making your mark. Don't forget to read more philosophical works than you have, I believe, done as yet. Get hold of Buckle's works and Mills - his essays and works have a great effect in enlarging a man's views on social questions. His Political Economy is an excellent study - better than all the classics from help to the River Styx for a man who wants to be practical in these practical times. It is eleven o'clock and have just read what I have written. I am too lazy to be critical over my own production but have somehow got the impression that I have been lecturing you. Don't blame me - but this sheet of foolscap which I got hold of because I couldn't get a sheet of note paper - and which I was loth to send nearly a blank - and moreover it has given me the opportunity of spending in careless thought a pleasant hour with a spirit I think somewhat kindred to my own. I ought to finish now in pity to yourself for this infliction but must do so with another bit of advice. Learn to imitate the example herein given and say little in a good many big words. The Latin quotation for this would look a good deal better - but I don't believe in the style. I open this to say that I left it two or three days ago to be posted. Congratulations, unless offered immediately after success, are very stale and insipid to the receiver - and I have a great mind to pitch this in the fire and, if it was not very unmannerly not write another one. So for the sake of pleasant acquaintanceship which I hope and believe you will not decline to give this a more cordial reception than it deserved. On January 1880 the Elizabeth and Sam were shocked by the death of her father. He had been depressed for some time and was drinking heavily. Having threatened suicide on several occasions Lizzie’s brother John found he had hanged himself. Fourteen years after the birth of their first son Sam and Lizzie had a daughter, named Gertrude Margaret Catherine, born 24 July 1883.